We are admiring the vastness of the Atlantic ocean on the drive toward the Cape of Good Hope when, all of a sudden, our attention is drawn to something on the road ahead of us. 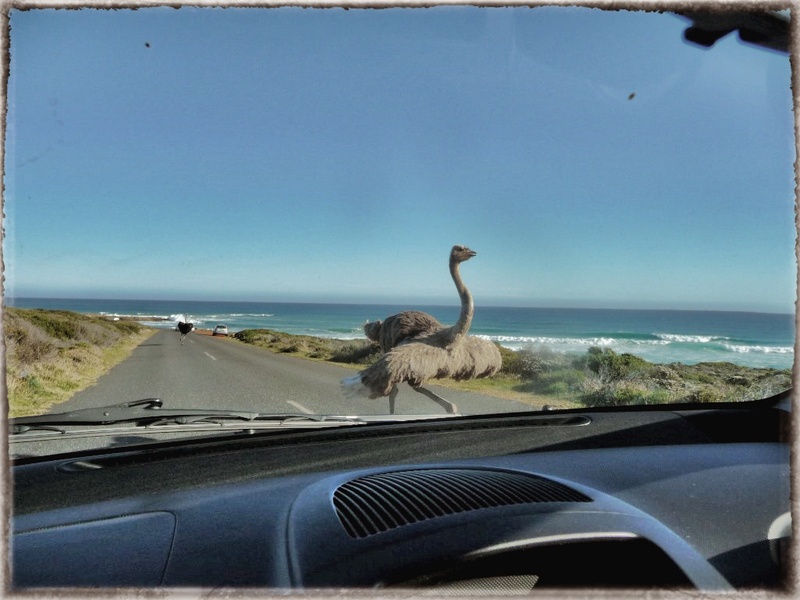 Our minds try to make sense of the picture of a flustered female ostrich running at a pace straight toward the car. Her stubby wings are flapping around as she wobbles down the road like a drunk marathon runner. I stop the car and she stops in the centre of the road. Further down the road we get to see the reason for her running – an obviously horny male ostrich. He also stops. The large female (standing well over 8 feet tall) sizes up the situation. Our small Ctiroen car ahead of her and a large horny male behind her. What to do? After a brief moment she moves to one side of the road and runs around our car and sets off on a new escape path. The chase is on again. The over-sexed male is not going to let this one get away so he starts moving his gangly legs again and gets up to quite a speed as he passes us without stopping. We look at each other in disbelief and start laughing at the comical scene we just witnessed. Welcome to Africa! This entry was posted on Tuesday, September 4th, 2012 at 4:30 pm	and is filed under Africa, Cape Town, On The Road, South Africa. You can follow any responses to this entry through the RSS 2.0 feed. You can leave a response, or trackback from your own site.